Kitty: So first of all, tell us about yourself! Ian: I was born and grew up in Huddersfield, Yorkshire (I am still in disbelief that the Tour de France will pass within 5km of my parents’ house!) I went to university in Loughborough, where I drudged my way through Chemical Engineering – God knows why I went for that but it worked out to be quite handy for seeing the world. I’ve been from the outback of Australia to the Atacama in Chile because of it. My first ‘real’ job was in Uganda, commissioning a cobalt plant, for a year. From there I went to Australia for 11 years, project-managing jobs in the Outback, South America, even Mali for a few months. As part of the Mali gig I organised a little break to the Tour de France with my best mate. 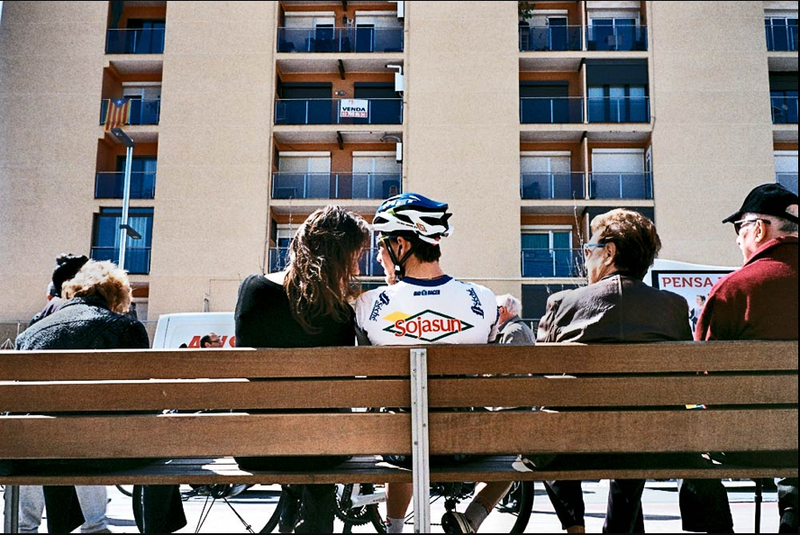 We bobbed across to Barcelona for a weekend, grabbed a car, rolled across the Pyrenees to Hautacam and saw Cadel Evans get his first yellow by a couple of seconds from Frank Schleck. It was great to see the nice – oft misunderstood – guy see some success. The kicker, for the ‘now’ part of the tale, is the Barcelona bit. After about 10 or 15 minutes I said to my mate that I was going move here and live here I was so taken with it. Three and a half years later, I quit my job to move to an old farmhouse in St Feliu de Buixalleu, Catalunya, about 30km from Girona. Seven months later, I was in Barcelona where I am now. The plan was/is to escape the rat race and live. Not exist, live, enjoy… I just followed my instincts and my passions for cycling and photography and hoped I could make something happen. Kitty: Have you always been interested in photography? When did you get your first camera? Ian: My dad was a keen photographer and had all the dark room kit to go along with his Olympus OM10 SLR with manual adaptor. He is also a runner, cyclist and triathlete so we were always heading off somewhere in the north to a fell race, marathon, cyclocross or something on the weekends. I don’t remember if we have any photos but I remember often having the Olympus with me. I loved changing the lenses as much as anything initially. I can still hear and feel the clunk of the lens locating in the body. I have a soft spot for film and still use it when I can. I think that has helped me because you can’t shoot a few hundred images and hope for the best. You get 36 chances, then you are forced to reassess mentally as the process of changing the film makes you think what have I just made with those 36? With digital it’s snap snap snap. You can be a few hundred frames down before you start thinking, if you aren’t careful. If I think I’m getting lazy in digital, I go back to film and it reminds me to shoot more thoughtfully. I got that from using that old Olympus. Kitty: When did you get interested in cycling? Who are some of your favourite riders? Ian: Cycling, I think, probably, Stephen Roche versus Perico Delgado in ’87 at the Tour. La Plagne, the mist, the drama, the oxygen and the collapsed Roche. I finally rode La Plagne in 2011 and I could remember the finish line in the fog … I got goose pimples. The Tour in 2008, Cadel Evans in yellow after Hautacam, Cavendish getting his first Tour stages – feeling those things from the roadside and in cafes in France just lit the fire that had been smouldering for years. I like Cadel for battling all the time with, seemingly, inferior teams and for being himself. 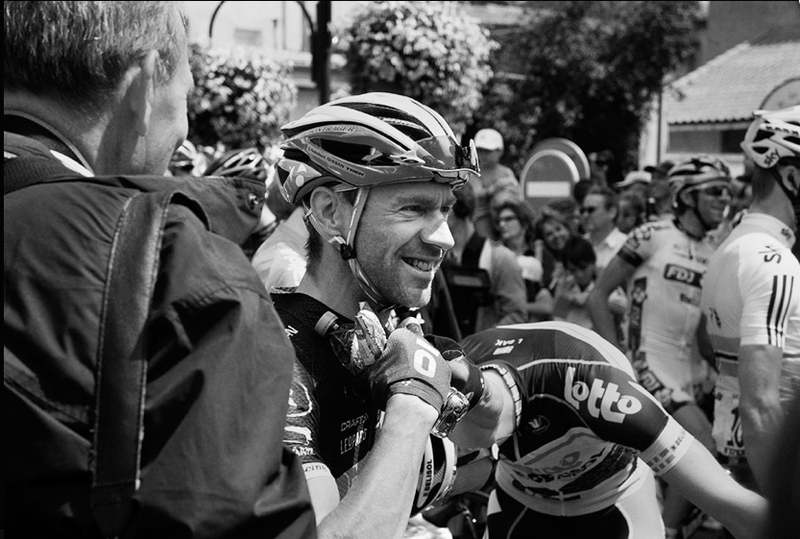 Favourite riders: Cav straight off. I love his straight talking. I don’t get the moaners who say he whinges. I reckon he just doesn’t give bland soundbites. Wiggo has grown on me big time, not because he has won the Tour, but because of his frankness and for the massive pull he did in the Worlds for Cav and then riding in yellow onto the Champs in Paris. Jens, of course – I was very pleased that Bicycling mag in the US asked me for one of those images recently. I was in with the crowd with my girlfriend while Jensie was chatting there. I was a bit silly for her and shouted ‘shut up, legs’. Of course everyone does that, but it was funny I saw his eyes flicker just a little so I said it once more and he gave such a genuinely warm smile. The little things are great. Ian: It’s kind of like they were taken in a different time as they were shot on film! I played with a few films through the Leica and found the one I used was really saturated with colour and quite grainy. I liked it for the reportage style. I went to a café in the morning, chatted with the locals in Span-glish-talian, took my time to feel the atmosphere on the day, wandered around again talking to locals and blow-ins. I didn’t chase up the mountain. 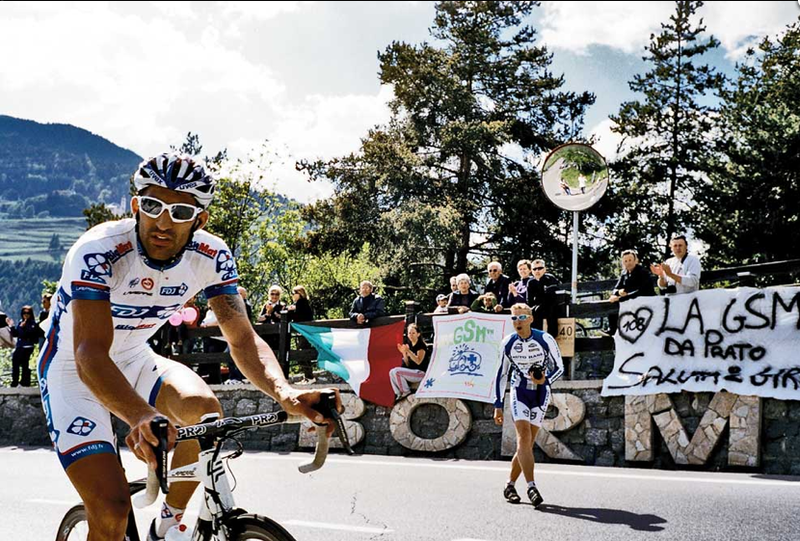 I wanted to get carried away with Bormio and the Giro, not just the race. 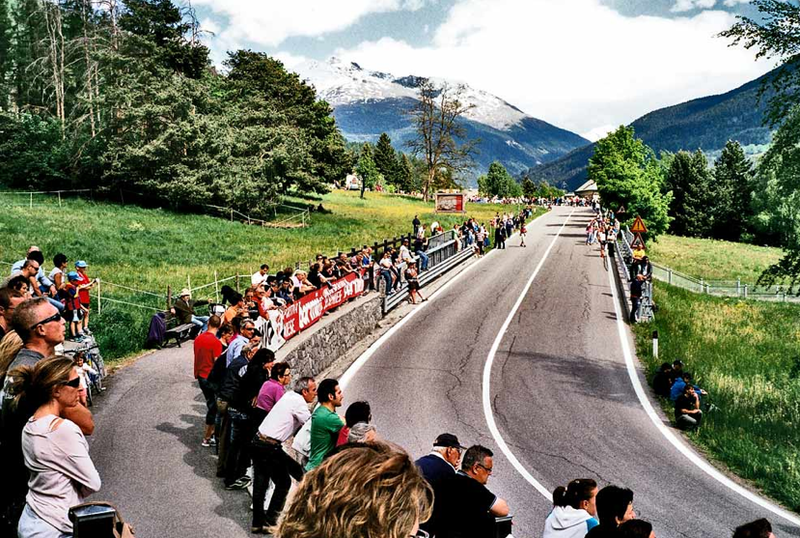 The Giro is amazing and the people make it as much as the places. The post-processing also reflected that because it isn’t over-processed. I am not a Photoshop genius – I do what you could do in a dark room generally. Kitty: I also love that you take a lot of photographs of the surroundings of the race, the atmosphere, the crowd, sometimes you just see the blur of a cyclist – talk us through that. 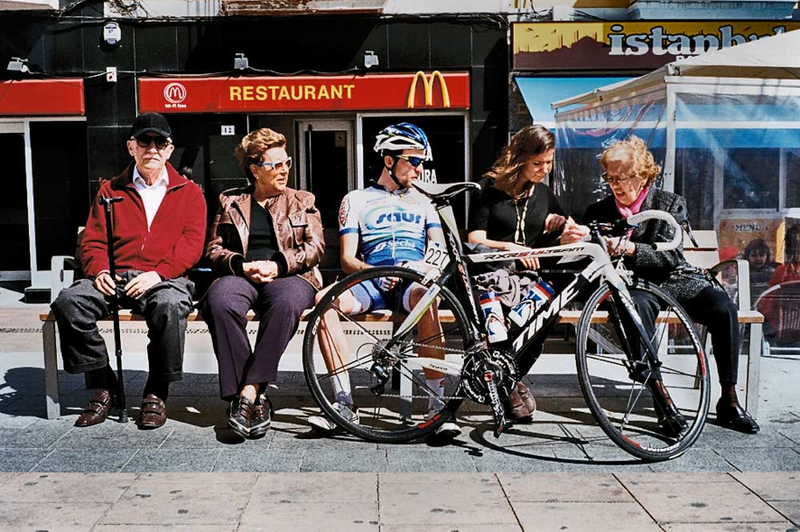 Ian: I love capturing one of the most important elements of the bike race: the support, the people, the towns that allow us to invade their peaceful paradise. With that sometimes I feel the detail of the cyclist is not important. He or she is a part of the whole so I can feel a blur coming on, or an aggressive crop leaving most of the cyclist out of frame. I don’t plan a lot of images in detail, it’s just a reportage style. Pass on the feeling, not just the shapes in the frame. Kitty: Then there are the landscapes – like the Stelvio set – that have a resonance for cycling fans. Your photographs are very epic! I really love the tunnels – you can see almost every crack, every crumb of dirt. How do you get these photographs, both from the almost hyper-reality of the detail but also with no people or traffic, the isolation? 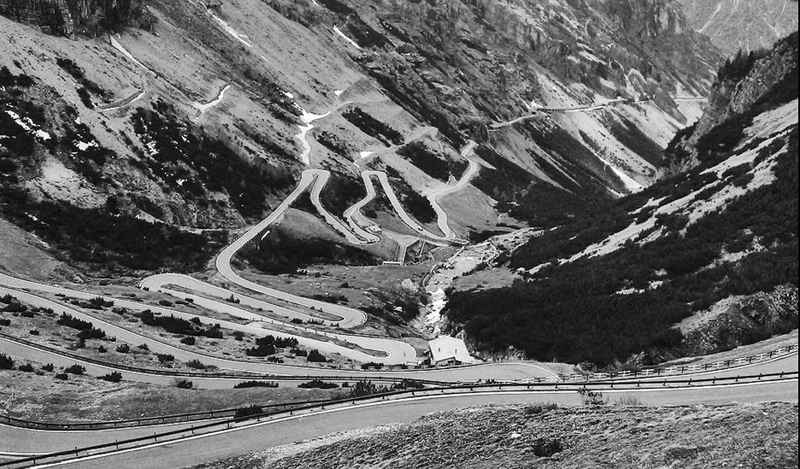 Ian: I was riding the Stelvio from Bormio after we had driven up from Barcelona and it had been raining and sleeting the whole way – every kilometre. When we got to Bormio, it was late afternoon, but the rain had stopped. 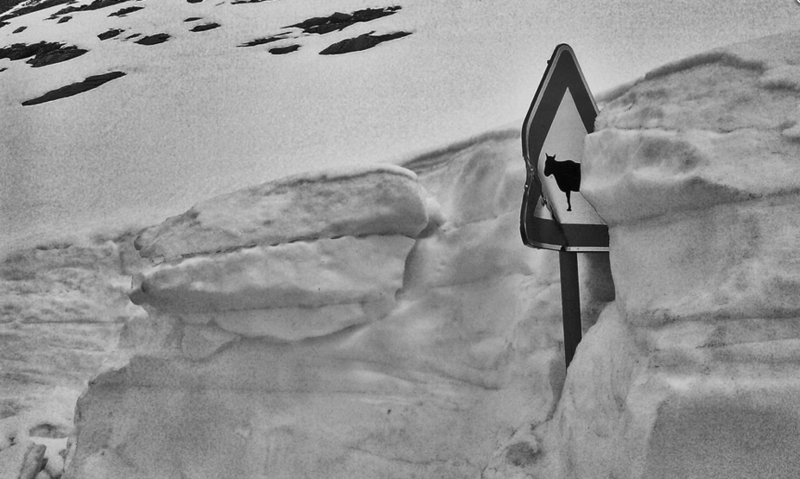 It was still grim out but I wasn’t sure whether that would be the only dry bit of the week – and we missed out on the Stelvio the year before as it was ‘closed’ and we were too chicken to ignore that warning that year. So I put the bike together, put on all the clothes I could and grabbed the camera and went out alone as no one else was keen. It felt epic even only getting about six or seven kilometres up. Next day, weather was better but ominous and I still had the feel of the darkness from the night before so I just carried that into what I was seeing. 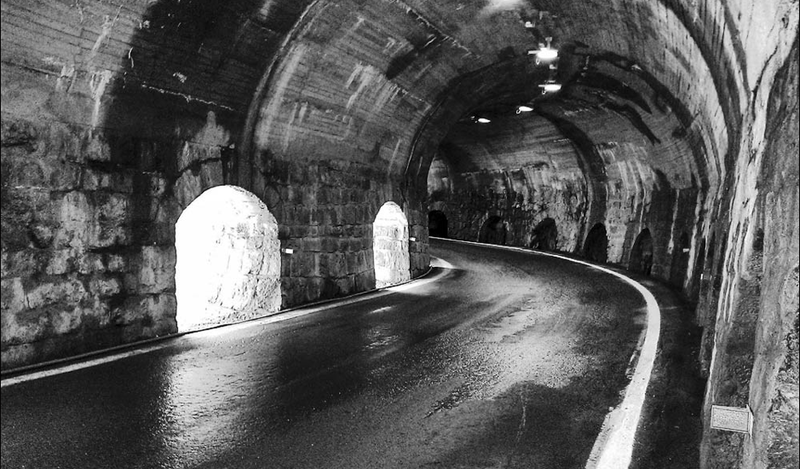 The tunnel felt like the two rides, dark night, brighter day, still really wild and wintry. It felt bigger because of the cold and wet and dark from the night before and I had just stepped out of being trapped in a Citroen C15 for hours on end so it felt so big and open I wanted to grab that. Kitty: This is the point in the interview where I ask you to take me through some of your favourite images. So what are they? 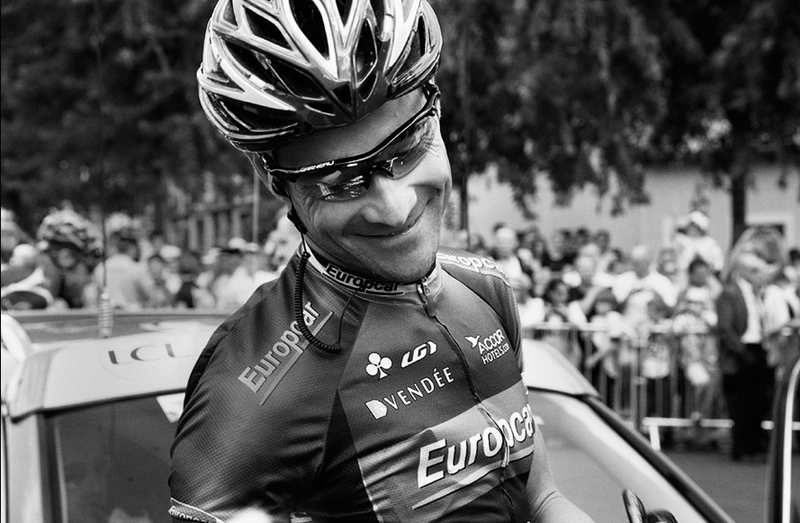 Ian: I find it really hard to narrow it down, as a lot of my work I try to take as a series of images that tell a little story or reveal something about someone collectively, like the Thomas Voeckler images. Individually they show a chirpy cyclist being interviewed or autographing but collectively I think they show a little more about him. 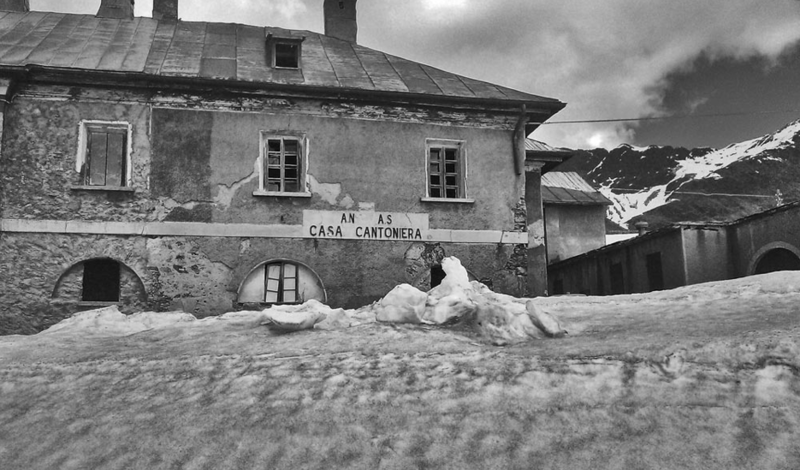 At the Giro in Bormio, this simple image takes me back to what the Giro does to each village it touches. It’s taken over, but it’s celebrated. It’s peaceful for me. 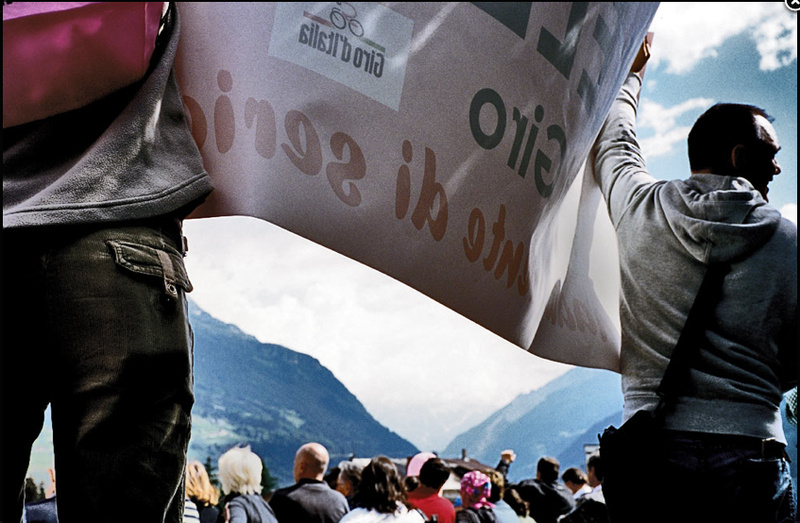 I really like these from the Giro, Bormio piece because I think it makes you feel as though you are there, watching, involved, not detached and looking at an image. They take me back to the day. And the one below is from the same set. I like it because of WW108, which you can see on the white handpainted sign. 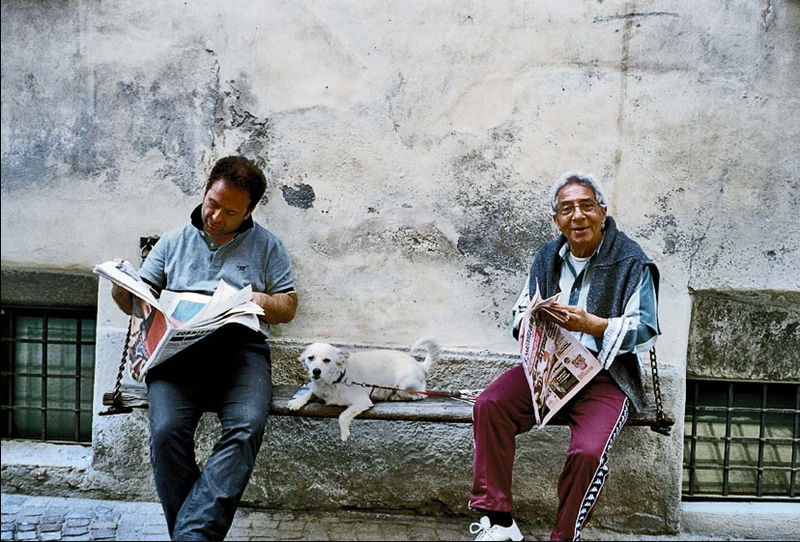 These pictures from La Volta really mean something to me, because they capture both a little quiet time for Jean-Marc Marino with his partner to his left. Technically, perhaps not perfect – it might be a bit distracting with so much going on – but I like the moment. I don’t think the older couple to his right were with him, just relaxing on the day – but I could be wrong. 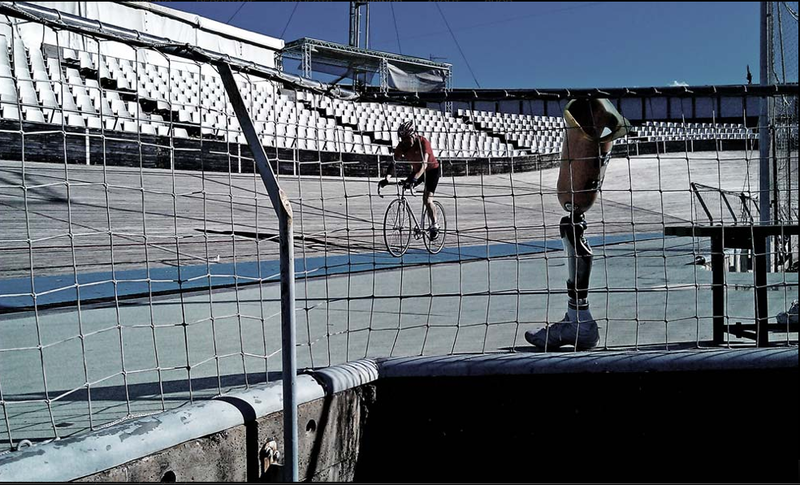 An opportunistic shot I took while I was returning from a ride here in Barcelona was at the Horta Velodrome – the last permanent open air Olympic velodrome to be constructed (Atlanta was temporary). There is a disabled team who train there and I went on the track for a little fun roll around, then just relaxed a little and watched these guys and girls going round, then quickly made a couple of images and then left. Kitty: So what’s next? What are you hoping to shoot this year? Where do you hope you are by December 2013? Ian: This year has started fast already. 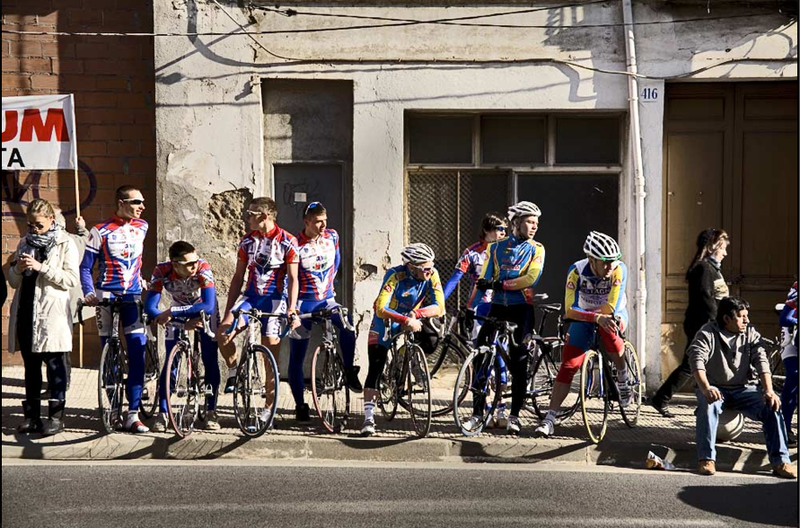 I am doing some work with a top-end bike tour company, Thomson Bike Tours. who are based in Sitges, south of Barcelona, at the moment. We are ironing out the details as we speak, but it looks like a few interesting projects on the way. I did some work for The Outdoor Times online magazine last year. We are going to chat soon to arrange some projects for that which I am looking forward to. I have an article in The Ride Journal’s February issue. It would be nice if some big decision-makers see my work and offer me some interesting things to do. Selling my services has been the hardest thing to learn since I really started doing this. But most of all, I want to remember how glad I am I quit work to chase the dream. Still chasing. It’s a fun chase. Follow Ian as TheMusette on Twitter and visit www.themusette.cc to see more of his work. Great interview. 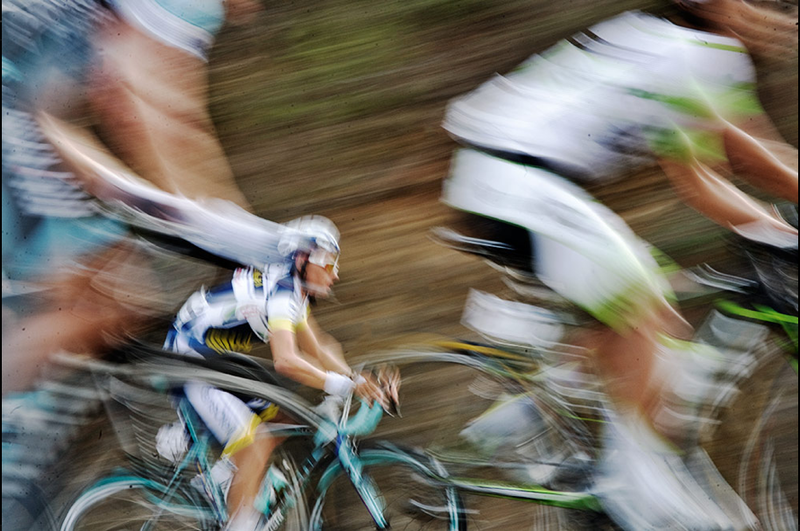 And I think the photography is outstanding – very evocative, atmospheric shots which capture the spirit of cycling. 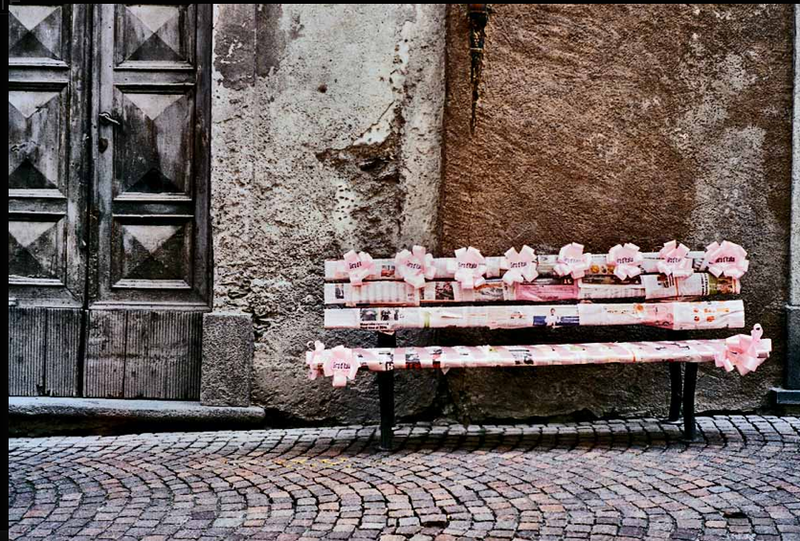 Simple gorgeous and very evocative photographs, thanks for sharing them with us and our readers. It’s nice to “meet” another alumnus of Loughboro’. Well done Ian & Kitty for the great story. I was fortunate enough to spend the Haute Route Alps race 2012 pedalling along with Ian & comparing notes for hours on end. We talked all the way up the hills & then got down to business on the descents. Not only did we connect in conversations, but there are few riders going around that can connect like we did on the downhills. A man of many talents our Ian & all round nice guy. Thanks Pat. What a cracking place to meet, the Alps. On a bicycle. I think I listened more of the climbs, I had little breath for anything else. The descents were like a dance. Great fun. Thanks all. Great talking with Kitty. Delighted so many people like my work. Great interview, Ian, and thanks for the namecheck.